ALOHA! THE ANNUAL HAWAIIAN LUAU COMMUNITY DINNER April 25, 4-6 pm hosted by the SS Center and held at the Silverton Elks at 300 High St. with the Dinner provided by the Silver Falls High School’s Culinary Arts Dept. Entertainment with SUN the Silverton Ukulele Network complete with Hula Dancers! Tickets are $25 and this is a very family friendly affair. Hawaiian Attire is encouraged. All ages welcome! No host bar available and tickets are on sale at the Senior Center & Silverton Elks. Pay by cash, check or credit card/debit via Pay Pal. ROCKIN’ CASINO—THE CASINO NOT IN RENO May 4, 4-9 pm at the Senior Center. Doors opening at 3 pm for Auction Viewing. Live Auction Packages and Super Silent Auction Gift Baskets and items! Tickets are $25 and include $500 in scrip (Elvis Money) for playing Casino Games and using for Silent Auction. Free door prize entry for a Traeger Elite Jr. BBQ compliments of Chuck’s BBQ Store in Keizer with a Meat Box compliments of Mt. Angel Meat Company and a bag of pellet. Live Auction is cash only and the list will be available on line and at the SS Center. No Host Bar available and Baked Potato Bar for $10 catered by the Wooden Nickel. Tickets are on sale NOW and at the door. THE ANNUAL VOLUNTEER APPRECIATION PARTY for SS Center, Thrift Shop and Meals on Wheels Volunteers too! APRIL 18, 1- 3 PM at the Senior Center. Please RSVP to Dodie at 503-873-3093 and/or Carol 503-873-6906.
ourtownlive.com Our Town mailed free to residents and businesses in the 97362, 97375, 97381 zip codes. Subscriptions for outside this area are available for $48 annually. The deadline for placing an ad in the May1 issue is April 20. Thank you for spending time with Our Town. Your comments and suggestions are always welcome. Nonmembers still need to be 50+ unless otherwise stated. Milk dispensers improve schools’ environmental efforts Elementary School began working toward becoming an Oregon Green School – a move that required they document their waste reduction initiatives. •	18 percent of Marion County’s population is K-12 aged students. • Food and paper waste make up the largest percentage of waste in Marion County. •	One gallon of milk is equal to 0.7 gallons of gas in environmental impact. • It takes 291.5 gallons of water to produce one gallon of milk. •	50 percent of school cafeteria trash is milk cartons. the dispensers were installed. Now it’s about 43 gallons which is an 83 percent decrease.” Butte Creek too has seen a marked decline in milk-waste. Listen, Communicate, Do the Best for My Clients. Now Pacific Honeybee keeps more than 1,000 colonies, which they move from crop to crop, pollinating fields all over Oregon and California. The smell of sweet honey is undeniably in the air in The Honey Haus, a unique Mount Angel shop that offers over eight different varieties of honey on tap. beekeeping company Anderson-Rumely owns with her husband, Leo Rumely – is both raw and 100 percent pure, making it a combination of tasty as well as healthy. The necessity of trucking their bees from one state to another is one of the reasons Anderson-Rumely is adding one more product to the list of things The Honey Haus provides – education. The Rumelys, who have been in the commercial beekeeping business for eight years, both grew up around grandfathers who were beekeepers. “My husband’s great grandparents met beekeeping,” Anderson-Rumely added. But for the Rumelys beekeeping started out as a side-business that soon took off. “If it was in more people’s hands, that would be great,” she said of the need for more U.S. beekeepers. According to Anderson-Rumely, much of the honey used in the United States is currently imported from other countries and most of that is impure, contributing to both lower honey prices for American beekeepers and an inferior product for customers. world charm in downtown Mt. Angel in the Charles • Willamette Mt. Angel • 503-845-6222 • glockenspielrestaurant.net heart St. of the Valley. We are proud to feature an extensive wine list from Oregon Sun. - Thur. 11am-8pm • Fri. & Sat. 11am-9pm and around the world. Watch for our special upcoming wine and dine events. Easter is April 21st, join us A worlđ class experience in small from 11am-8pm for specials. town atmosphere. Spargelzeit is heretill July 1st. Come and experience fine dining and old 190 E.
Have a home to rent? Call us! We specialize in Residential Properties. •	Withdrawing. •	Change in moods and behavior, dress, or appetite. Nurses open new foot care clinic at Silverton Senior Center By Melissa Wagoner When Angela Smith found out the foot clinic offered by Legacy Silverton Medical Center for the past 28 years was being discontinued she knew she had to do something. So she took a leap of faith and decided to open her own. “I just think it’s so important and these patients were in a panic,” she said. The nurse-run clinic, which Angela is calling Silver Angels Foot Care, will continue offering the same basic services – toenail trimming, filing of calluses and screening for circulation and skin issues – that the estimated 275 patients have come to expect. One of those patients, 89 year-old Herb Spady, has been coming to the foot clinic for several years and recently convinced his wife, 82 year-old Edie, to join him. “I was surprised when I couldn’t reach my toes,” Edie said, shaking her head. “It’s kind of weird when you’re in perfect health and you can’t get near your toenails.” Edie’s plight is not an unusual one, according to Leanna Smith, a nurse who worked at the original footcare clinic for 22 years. We’re the leader in the industry and the best at what we do. We pride ourselves on being a local employer and our goal is to educate homeowners and building professionals as well as supporting our community. Silver Angels Foot Care Silverton Senior Center 115 Westfield St. Tuesdays and Wednesdays By appointment only: 503-201-6461 $40, cash or check (gift certificates available) Silver Angels Foot Care’s Jackie Niemeyer, Angela Smith and Leana Smith. The staff – which includes four registered nurses and two volunteer receptionists – also enjoys their time at the clinic and are excited for the next phase. Brokers licensed in the state of Oregon. Welcome to our newest agents! By Nancy Jennings Effective April 1, Silverton Area Community Aid (SACA) began offering weekly food pantry visits rather than monthly ones – and added evening hours Thursdays from 6 p.m. to 8 p.m. According to SACA Communications/Events Coordinator Paul Scoville, “We went from a system where a person or family could come in for food once a month to now once a week. It’s taken quite a bit of time, energy and effort to make the change,” he said, adding that the expansion of services coincides with SACA’s vision of wanting to provide people in need in the community with more access to food. SACA Executive Director Sarah DeSantis explained that SACA has also been working to purchase and acquire more fresh and frozen items like fruit, vegetables, cheese, milk, eggs and meat. “Fresh and frozen foods are often more nutritious than shelf-stable ones, which have traditionally been the mainstay at food pantries,” DeSantis said. “We’re making great use of our resources to increase the fresh and frozen food offerings in our pantry. It made sense to move to weekly pantry visits both because we wanted to provide more food throughout the month – and because fresh foods don’t last as long as shelf-stable ones.” SACA used to offer about an eight- to 10-day supply of food per household during a monthly visit. Now it can offer about a five-day supply of food each week, a sizable increase. “To gear up for this change, we modified the pantry layout to improve efficiency and make more space for fresh food. We also brought in some new volunteers to accommodate the addition of the new Thursday evening shift. Our community always steps up to help, for which we are ever grateful,” DeSantis said. Paul Scoville, SACA’s Communications/Events Coordinator and Sarah DeSantis, SACA’s Executive Director. who meet federal income guidelines. In addition to the food pantry, SACA also provides financial assistance for items such as rent, utilities, transportation/fuel, and prescriptions. SACA’s updated hours of operation are: Monday, Tuesday, Thursday and Friday from 9 a.m. to 12 p.m. and Tuesday and Thursday evenings from 6 p.m. to 8 p.m. It is located in the Silverton Community Center, 421 S. Water St., Silverton. DIAPER DRIVE DONATIONS NEEDED: • DIAPERS (SIZE 3 +) • WIPES • PULL-UPS Your donation will benefit Silverton Together. •Distribute bags Thur. April 25 •Pick up bags and drop them off to SACA Saturday, April 27 CALL 503-873-3530 TODAY TO SIGN UP! 19-year-old, Anna Koch is setting out on the journey of a lifetime – a 2,663 mile trek along the Pacific Crest Trail. Along with taking a wilderness first aid course, Koch has spent the past several months preparing for her trip – working on her parents’ farm to save money and preparing her supplies. “I went to Costco last week and bought so much food,” she laughed. “And my friend was cleaning someone’s house out and she got me a bunch of dehydrated food.” Most of Koch’s food supplies – granola bars, cereal and a myriad of soups – are being left behind in nine, open resupply boxes at her parents’ home in Silverton. Silverton hiker Anna Koch, shown at right at the start of the Pacific Crest Trail’s start near the Mexican border. as is necessary. “I’ve done way too much,” she laughed. “It’s like a rabbit hole.” She’s also joined a Facebook group for PCT hikers where she can ask questions, get advice and meet others who are going to be on the trail. St. Joseph Dinner tickets on sale Catholic Community Services, St. Mary Parish and the Benedictine Sisters of Mt. Angel will be hosting the 15th annual St. Joseph the Worker Fundraising Dinner, Sunday, May 5, 5 p.m. at the St. Mary Parish Center, Mt. Angel. All are welcome. Funds raised will help sustain St. Joseph Family Shelter, Mission Benedict and Casa Adele.which provide clothing, housing and food for families in crisis and those in need. In 2018, Mission Benedict served more than 2,500 children and adults. The goal this year is to raise $70,000 to meet the ever-growing need for services. Every gift will be matched thanks to a donor’s grant. For tickets or to be an event sponsor contact Alexa Armstrong, 503-856-7062 or alexaarmstrong@ ccswv.org. Looking for an fun way to celebrate the upcoming 50th annual Earth Day? Head out to The Oregon Garden in Silverton for the 2019 Earth Day Fair April 20, from 10 a.m. to 4 p.m. This is the only day of the year that admission to The Oregon Garden is free to all. A number of earth-focused activities and presentations will be featured, including: • how to master backyard composting, • make your own reusable bag, • create your own seed starter pot, and more. Visitors are invited to stroll through The Oregon Garden’s 80-acre botanical garden, featuring more than 20 specialty gardens. Educational exhibitors, along with several nonprofit and student groups, will be located in the Garden’s Grand Hall. The celebration highlights music from the Early College High School Emaa Da drumming band, Ceili of the Valley Scottish dancing, and the Woodburn High School Mariachi Band. Plus, a local food vendor will offer tasty items for purchase. Free parking and shuttle service will be offered from the gravel lot north of Roth’s Fresh Market on Silverton’s First Street. Free parking is offered at Robert Frost Elementary on Westfield, two blocks from the Garden’s entrance. On-site parking is available for $5. Visit www.oregongarden.org for details. The 2019 Earth Day Fair is presented by Marion County Public Works Environmental Services, Renewal by Anderson, Salem Sign Company, Leaf Filter, Budget Dumpster, K2 Creative, the Oregon Department of Energy, and The Oregon Garden. Silverton High School wi ll host an open house on Tuesday, April 39, 6 - 8 p.m. The eighth graders abou t to become the Class of 2023 will be doing orien tation during part of tha t time, but the public is we lcome to join the tour and see what is going on at the school. Programs of Study open for viewing will include Agricultural Science (Pl ants, Animals, Welding, Fabrication), Engineerin g and Construction, Mechanical Technology (Auto and Diesel), Culinary Arts, Business and Management, Healt h Occupations, Compute r Programming, Integrat ed Communications and Te chnology, and the Protective Services Progra ms. The Kennedy baseball team is off to a 9-1 start and is 3-0 in Special District 2 play. The Trojans, who won three of four games in a tournament in Redding, California, are ranked No. 4 in Class 2A-1A by the OSAA after a 2018 campaign in which they advanced to the state semifinals. “We are off to a nice start,” coach Kevin Moffatt told Our Town. “I was worried about our pitching after graduating two of our main guys.” Now, like a lot of baseball and softball teams in the valley Kennedy is “trying to battle the weather now.” Sharing the pitching load for the Trojans are sophomores Brady Traeger, Dylan Kleinschmit, and Isaiah Basargin, juniors Bruce Beyer and Josh Valladares, and senior Braden Dover.” “They have kind of been the key to our start,” Moffatt said. “None are dominant, but they have all thrown a lot of strikes and kept us in games.” Offensively Traeger and Beyer have been leading the way, along with lead off hitter/shortstop Sam Grosjacques, Valladares and Cole Boen. Defensively, Moffatt said, senior Angel DeLaRosa and junior Demetre Marseille have been solid on the infield, along with catchers Kleinschmit and Valladares.” Trailing Kennedy in the league standings are Colton (2-0), Culver (2-1) and seventh-ranked Santiam. “The league is as deep as it has been in a long time,” Moffatt said. “We will have our work cut out for us if we are going to be competitive in the league this year, but the kids are working hard so far and if they continue playing like they have then we will be in the thick of the league race.” Silverton is 6-1 overall under new coach Jeremiah Runion and ranked 5th in Class 5A. The Foxes had yet to play a Mid-Willamette Conference game by Our Town’s presstime, while Central and West Albany already have two league games in amid the weather challenges. Two of the Foxes, Hunter Runion and Caleb Ward, have announced plans for college ball, with Runion heading to Montana State-Billings and Ward to Treasure Valley Community College. Silverton will field a veteran squad, with the roster boasting eight seniors. The Silverton softball squad is 2-8 overall and 0-1 in the Mid-Willamette Conference. The Foxes have had a pair of tournament games washed out. Ralph Cortez is in his 19th year coaching the Foxes. in the first nine games. Junior Erin Breshears, is playing third base and first base and hitting well in the third spot. Sharing the pitching duties are a pair of freshmen, righthander Mila Perez, who also plays first base, and lefty Otyillia Hefley. Another freshman, Olivia Hickam, plays shortstop and is batting second. “We are in one if the toughest leagues in the state in 5A and we hope to have a good showing with our young group of players,” Cortez said. “Growing pains will subside, and we are excited about our journey to be in the top echelon of teams in our classification.” The Kennedy softball squad is 3-3 overall and 1-0 in district play (with two rainouts). The Trojans were 24-4 a year ago and won the first state title in school history after outscoring their four Class 2A-1A state tournament foes 46-1. Gone from that team are four seniors who made amazing contributions, pitcher Tressa Riedman, catcher Abby Frey, first baseman Molly Jaeger and shortstop Hannah Arritola. Back are some key contributors from that championship team, including Hailey Arritola, Emily Cuff, Ellie Cantu, Elise Suing and Kelsey Kleinschmit. Hailey Arritola, then a freshman, singled, doubled, walked twice and knocked in 3 runs in Kennedy’s championship game win vs. Pilot Rock. Signings: Three-sport Silverton High athlete Jori Paradis has signed to participate in college at Concordia of Irvine. Concordia is an NCAA Division II school that plays in the Pacific West Conference. Paradis was a standout in cross country, basketball and track and field at Silverton. She will participate in cross country and track at Concordia. Paradis finished second in the Class 5A state meet last spring in the 800 and also is part of a 4x400 relay squad that holds the school record. She is 7th all-time in school cross country history in the 5,000 meters. “We went through our preseason with a tough schedule against some quality opponents,” Cortez told Our Town. Paradis told Our Town at Wednesday morning’s signing event that she chose Concordia because she liked the environment, the coach and the team. It’s a young squad with six freshmen, one sophomore, four juniors and three seniors. the steeplechase, an event that is not available for Oregon high school runners. Paradis said she plans to study nursing at Concordia. Also announcing college plans recently were Foxes Jonah Downey, who will play basketball at Clark College in Vancouver, Washington, and Ben Willis, who is planning to play football at Utah State. Downey was a first team all-Mid-Willamette Conference player who helped lead the Foxes to third place in the Class 5A tournament. Willis was a first-teamer on the offensive and defensive lines and as a place-kicker for Silverton, which finished 9-2. Willis plans to play defense in college. Wrestling: Keegan Davis, a standout wrestler at Sprague High School and Oregon State as well as a successful coach at Silverton, has signed on to be the first wrestling coach at Corban University in Salem. The Warriors will begin competition in the 2019-20 season. Tennis: The Foxes’ girls squad has a pair of undefeated doubles teams. The No. 1 doubles team of Alyssa Khieu and Aneisa Fink and No. 2 squad Genevieve Pavlicek and Jenevieve Overlin both won their matches on April 9 in a 7-1 team win vs. West Albany. Freshman Andrea Khieu also was impressive against West Albany, scoring a, 6-3 6-0 win at No. 3 singles. Basketball: Darren Shryock, who led the Foxes to a pair of third-place finishes in Class 5A boys hoops, has stepped down as the Stayton girls coach after three seasons. Shryock, who twice led the Eagles into the Class 4A state tournament, will continue as the athletic director at the school. Follow me on Twitter.com @jameshday. Got a news tip? Email me at jamesday590@gmail.com. Follow Our Town on Facebook. opportunity to purchase a dovetail box business after leaving Microsoft and enjoyed being self-employed. After setting up the website for his business, he began receiving orders from across the country, and realized he wanted to move out of the city, and that his business would allow that. He moved his family to Scotts Mills where they had a farm with turkeys, ducks, chickens, and goats. He continued his woodworking business and also developed websites for customers until health prevented continuing. He loved solving the challenges inherent in creating and building beautiful things from raw materials, had several ideas for books he wanted to write, enjoyed making sausage and apple cider, and could solve the TV mysteries within the first five minutes of each show. Jerry had a good sense of humor, loved his family, was a loyal friend, and loved God. He will be greatly missed. Jerry is survived by his wife of 26 years, Ardis Drain; his daughter, Rheannon Drain; his mother, Diane Ferguson; his sister, Patricia Dietzman; his nephew, Charles Dietzman; his sister-in-law, Linda (Jim)Hawthorne; nephew, Tommy Hawthorne; and niece, Valerie Hawthorne; as well as many aunts, uncles, and cousins. He was preceded in death by his father, Fred Drain. A service in celebration of his life was held on April 7, 2019, 2 p.m. at Scotts Mills Friends Church. Submissions welcomed: Our Town appreciates the opportuity to share life’s Passages with our readers. 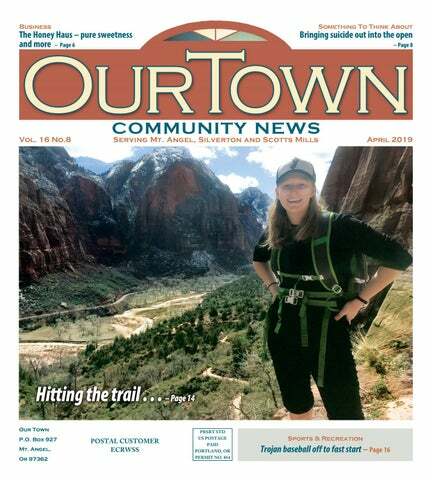 If there is a birth, engagement, wedding, anniversary, college graduation or obituary of a local resident you’d like to share, please send it to ourtown. 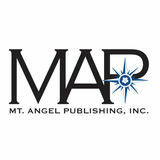 life@mtangelpub.com or mail it to Editor, Our Town, P.O. Box 927, Mount Angel, OR 97362, or drop it by our office at 401 Oak St., Silverton any weekday from 9 a.m. to 5 p.m.
FIREWOOD Fir/Cut/ Split/Delivered. Call for price 503-873-5235. FREE SEARS TREADMILL EXERCISER 503-767-4427. HELPING HANDS WANTED, FULL TIME PRODUCTION ASSISTANT Good listener, math skills, driving record, smoke/drugfree, own transportation, valid drivers license, U.S. citizen/Green Card. Will train. Skill and experience in cabinetry and the use of table saws, miter saws, routers, etc. $12 - $20 depending on experience. Mount Angel. Call Keith. 503-874-6109. SERVICES GOT STUFF YOU WANT GONE? From yard debris to scrap metal. From garage sale leftovers to rental clean outs. We repurpose, recycle, reuse or donate what we can. Call and find out what we can do for you. $20 minimum. Keith 503-502-3462. NOTICES POETRY READING An evening with Clemens Starck, Oregon Book Award winner and author of six books. Wednesday, April 17 at 6 p.m. Silver Falls Library, 410 S. Water St. 503-873-7633. HOMES & LAND CHANGING THE WAY MARION COUNTY THINKS ABOUT REAL ESTATE! Commissions Negotiated christymarsing.kw.com. Equal Housing Opportunity. RDR HANDYMAN & HOME REPAIR SERVICE Installation and repair of fencing, decks,doors, windows, gutter cleaner CCB 206637 licenced, bonded and insured. Call Ryan 503-881-3802. MICHAEL FINKELSTEIN P.E. Civil Engineer 503-873-8215. You Need, For Anything You Need To Do. fresh-cut, dry grass in late March have for budding princesses. Lucy discovered that “snow angels” on grass after a lovely spring day are every bit as exciting as the real deal at Mt. Hood Meadows. She is also pushing for a new Olympic event, “The Bicycle Rack Crawl”. She crawled under the long, inverted “U” racks nine times, setting a speed record for an event that few mortals can conquer. To think, it only took 20 minutes to make the journey from the gym door to my truck, nearly 100 yards away. There is good in the world. I see it every day when someone needs food and blankets for a family in hardship, and ten people respond, “Where can I deliver it?” I see it in a young mom who doesn’t hesitate to have another family’s toddler come over late at night because the dad had a sudden and serious medical condition. I see it in Rotary, as polio nears extinction. I look for good everywhere, but find it most consistently in a tiny little girl who is more entertaining than a dancing pelican. #ILoveLucy #PapaRocks #Gramp’sGotGame. Everything You Need, For Anything You Need To Do. a’s full line of hardworking equipment has a proven reputation high-quality engineering, versatility, power and reliability. Kubota’s full line of hardworking equipment has a proven reputation for high-quality engineering, versatility, power and reliability. Job ID#191422 Call us with any questions and ask for Cindy.